NOTE: This post was written as a joke and will probably not got updated any time soon. As such, it is a bit imbalanced. Fey dogs are an energetic race of canine-like beings. Typically, the breeds reflect smaller dog breeds rather than large, as they better fit the whimsical nature of faerie. Oddly enough, their name is a misnomer. While they live in the realms of faerie, they aren’t true fae, but rather one of many kinds of animals uplifted by fae magic. Few breeds are the adventurous sort, save for the rare few, as most tend to stay within their realms. This is either out of a fearful need for protection or phobia of the outside world. Those who wander away from their home realms do so to learn about the many worlds around them. To these lone strangers, the world is full of new sights, sounds, and even smells! For fey dogs, this new life is one full of excitement wherever they go. Despite their origins in the realms of Faerie, adventurous fey dogs are comfortable almost everywhere. Leaving behind their prejudice and fear, they adapt to new homes much like their non-sentient ancestors. And just like their ancestors, they are quick to bond to other races that become friendly with them. While fey dogs aren’t always willing to obey and listen, they prove to be very faithful companions in the long run. EDIT: Even though the base idea wasn’t mine, I’m in the midst of reorganizing due to people copying the work I have done. I might rework the base stats of this into another work or project though. If it becomes a product, the base stats provided here might be removed and a link put up in their place. Until then, enjoy this living draft. Ability Score Increase: Your Charisma stat goes up by 2. Age: Fey dogs become adults by age 10. Most live to around 40 or 50 on average. Alignment: Fey Dogs span many alignments and ideals. Their tendency toward loyalty and strong faith leads to lawful alignments being very common. Size: Like your ancestors, you are a small creature. Despite your size and debated cuteness, you are more than capable of holding your own. Being a small creature does have its disadvantages though, as per size rules. Speed: You are able to shift between the four legged stance of your ancestors and the 2 legged stance of your race with ease. 25 feet on 2 legs, 35 feet on all 4. You cannot take any other attack action besides bite while on all fours. You can try to use a weapon in your mouth with disadvantage while in this position. Using your bite does not impose disadvantage. Dropping to all fours takes only a free action, but getting up to two legs works the same as getting up from being prone. Scent: You gain advantage on all perception rolls using a sense of smell. You do not gain advantage on checks using other senses. Darkvision: Thanks to ages of adjusting to the night’s sky with canine kin, your race has the boon of contending with darkness. You treat darkness as if it were dim light and dim light as if it were bright light. You have Darkvision out 60 feet. Biting Jaws: Due to your canine heritage, you are able to bite on foes who get in your way. You are proficient in a bite attack that does 1d4 piercing damage, utilizing strength. In addition, it can be used as off-hand attack. As you gain levels, your bite gains power. Upon reaching level 9, your bite increases to 1d6. At level 18, increase to 1d8. Languages: You speak Common and Sylvan. You are able capable of speaking with any canine based species or race. Ability Score Increase: Your Wisdom stat goes up by 1. Ever Vigilant: Fey Corgis are used to keeping an eye out for trouble. This can be for a desire to spot small animals or protect those they care about. All fey corgis are trained in Investigation and Perception. Ability Score Increase: Your Dexterity stat goes up by 1. Crafty Little Doggie: Fey Shibas are known for partaking in delightful mayhem, whether that’s just a stereotype or a joke. None the less, they’re well known for agile feats and clever speaking. All fey shibas are trained in Acrobatics and Persuasion. Some Fey Dogs are exceptional in their talents, able to sample magical powers from their faerie heritage. Whether it’s paralyzing the for from your extreme cuteness or consulting an extraplanar force known to many as “dogge” to pose as a distraction, or possible your connection to nature in general; your magical abilities have the potential to be respectable or feared by many. Your bite attack can utilize Dexterity instead of Strength. You gain Friends and Vicious Mockery as cantrips, which you may cast at-will. You are able to cast each of the following once per long rest: Ensnaring Strike, Hold Monster, Hunter’s Mark, Sanctuary. Once all have been casted, you must take rest before using again. A Fey Shiba takes to the skies, with the help of a Fraal buddy. Created by Doctor Necrotic for Doctor Necrotic Media. Original race from the /tg/ board on 4chan. As silly as this seems, I would actually allow this as a race option in any game I run. Thank you for making this. Thanks! This is in part a conversion of content made by 4Chan’s /tg/ board as well as using other internet phenomena to craft an alternate sub race. So, it’s very tongue in cheek, but I’d love to see it used in a less goofy manner. Well, I am still planning on doing a kind of raygun gothic redux of spelljammer. So this and other animal races are just another kind of alien race. Which in some ways is the point of the setting. I can see how this could be a serious choice for my players. With standing up or getting on all fours a full move action seems a bit much. Also both sub-races have the same bite so shouldn’t they be a bit different, or more likely since it looks balanced, shouldn’t it be something the race as a whole gets while the sub-races get something unique? Hey is this compatible with Pathfinder? Cause this is pretty damn awesome. As written, not really. 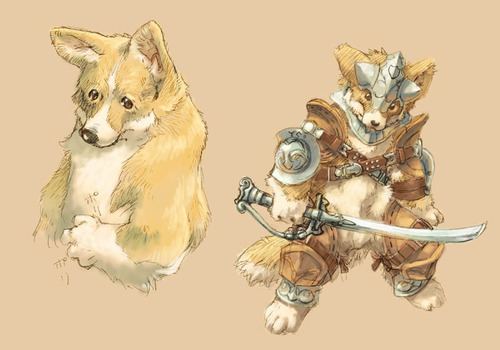 This race was based off the 3.5/4.0 race called “Fey Corgi” made by the /tg/ board on 4chan many years ago. That would probably adapt better than this race, which is meant for D&D 5th Edition.